Three keys to big bass in April on Champlain! I’m going to set myself for ridicule by saying that I’m a lifetime resident of New York, but I’ve probably only fished Champlain about 10 times. Now before you pummel me with stones, understand that I’m about 4 hours away from Ticonderoga and that Plattsburgh is an hour further. The fact that I’m less than two hours from Cayuga, Oneida, Ontario, St. Lawrence River, and only 3 hours from Lake Erie, should help explain a bit why I haven’t made the trip more often. However, I recently learned that the water temp there was in the middle to upper 50s last week, which would put it about 10-15 degrees ahead of my more traditional fishing spots in Central New York, and means that prespawn jerkbait bite should be HOT. So we packed up the boat, and headed up. Not sure who to pick for your Fantasy Fishing Team to kick of the B.A.S.S. season at the 2015 Bassmaster Classic? Your’e in luck! I asked over 2,000 people who they are picking to win, and from lucky cheese, to Cinderella Stories, here are the top picks most think have the heart to win it all at Hartwell! 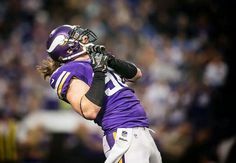 Millions of fans cheer Brian Robison for terrifying opposing quarterbacks, and at 6-3, 259, there’s plenty of cause for that. But pay attention to his hooksetting sack dance and you’ll see that under the purple and gold jersey, number 96 is fisherman just like you and me. See more of Jim’s stuff here!